Retaining walls can be used for practical reasons such as soil retention, gaining additional ground or just as an accent around a flowerbed or garden area. Segmental concrete retaining walls offer the most choice, sizes and strength. Some require pins or clips to develop strength and alignment while others offer interlocking portions built into the block for ease of use. It’s important when shopping for any retaining wall to know your maximum height requirements because not all segmental retaining walls have the ability and same height requirements. As an example, most any segmental wall by definition can go 24″ in height, but many can’t go beyond that. While others can go as high as 5 feet tall and more with additional help using a product called Geogrid placed in the soil bed behind the wall. Don’t be riddled and tempted by the cost of product found at the big box stores because they probably won’t meet your needs if there above two feet tall. 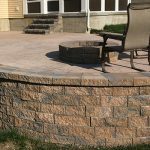 The professionals at Saratoga Masonry Supply can help you choose the style and products that best suit your needs. We have spent many years choosing the best quality products and manufacturers that offer the widest styles and colors at a price you can afford! 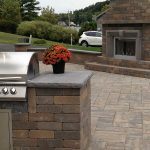 Undeniably the most popular portion of landscape hardscapes, the paving brick has had the attention and continues to be the marketing focus of every hardscape manufacturer. A paving brick is a specialty item made to withstand the severe climate conditions while providing lasting beauty to any outside décor. By definition, a paving brick does not refer to its shape or size, but to its very high density and inability to absorb moisture. Most quality concrete interlocking paving brick actually develop 9000 to 10,000 pounds per square inch of density compared to the concrete footing below your house or your concrete sidewalk of only a compressive strength of 3500 to 4000 pounds per square inch! Thickness of a paving brick for residential or commercial use is important and one should not choose a paver of less than 2 3/8″ for any type of traffic light or heavy. Most quality paver manufacturers warranty their material to the end consumer for a lifetime under limited conditions. If your choosing a paver that doesn’t have a lifetime warranty, maybe you should reconsider. If the manufacturer doesn’t have the ability to back up its own product, than why should you? How can you argue against the natural, everlasting beauty of natural stone? Millions of years in the making, natural stone compliments and beatifies any space regardless of style, color or origin. We like to say we are in the business of selling dirt; just what we sell is dirt in different stages of its life. Natural landscape stone can be used to build a retaining wall, a garden bed edging or wall around your plantings and flowers. Sometimes that same stone can be used to lay down an irregular sidewalk or pathway, add stepping pieces throughout a garden or put the “rock” back into your rock garden. Everlast Stone offers the widest variety of natural stone from all over North America while Adirondack Stone provides unique natural stone from the local area sure to compliment any outdoor decor. The folks from American Bluestone from Sidney, N.Y.Â offer the beauty of bluestone used commonly as sidewalks, patios, fireplace hearths and mantles. Whether it be true blue or variegated in color, bluestone can be shaped and customized to meet your needs and style. Custom orders are welcome and quoted upon request. As important as it is to selecting the proper landscape hardscape material for your needs, it’s just as important to include the proper supplies and accessories to ensure its integrity, stability and overall look. Ever thought about what’s going to keep your new patio or sidewalk from spreading away with time and separating causing large joints between the brick? Check out Brickstop for all your plastic or aluminum paving edger material, designed to be invisible when installed, brick edging provides lasting retention of your sidewalk or patio. To keep weed growth and stability around those patio brick, we offer joint stabilizing polymeric sands from Techniseal in many different colors to compliment any sidewalk, driveway or patio. Have a stamped concrete walk or patio or just want to bring back the life and color of you outdoor living area? Check out the quality sealers and strippers from Glaze n Seal. Stocked in invisible to the wet-look, Glaze n seal sealers can protect and restore the luster your outdoor area once had.